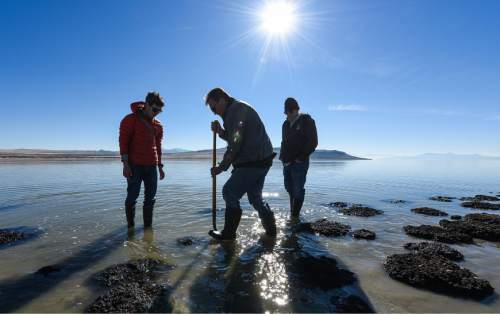 Francisco Kjolseth | The Salt Lake Tribune Researchers pull small rock like structures formed by cyanobacteria from the Great Salt Lake. These domed structures cover about 386 square miles, nearly 23 percent of the lake's bed, and offer a glimpse of what the Earth was like for its first 3 billion years. Francisco Kjolseth | The Salt Lake Tribune Researchers pull small rock like structures formed by cyanobacteria from the Great Salt Lake. These domed structures cover about 386 square miles, nearly 23 percent of the lake's bed, and offer a glimpse of what the Earth was like for its first 3 billion years. Francisco Kjolseth | The Salt Lake Tribune Researchers pull small rock like structures formed by bacteria from the Great Salt Lake. Known as microbialites, the specimens will be on display Saturday at the Natural History Museum of Utah's annual Behind the Scenes event. The public is invited into the museum's labs and collections rooms from 10 a.m. to 5 p.m. Francisco Kjolseth | The Salt Lake Tribune Tim Lee, left, an exhibit designer with the Natural History Museum gathers microbialites with geologist Mike Vanden-Berg along the shores of The Great Salt Lake. The small rock like structures formed by cyanobacteria, offer a glimpse of what the Earth was like for its first 3 billion years. Francisco Kjolseth | The Salt Lake Tribune Researchers pull small rock like structures formed by bacteria from the Great Salt Lake. Known as microbialites, the specimens will be on display Saturday at the Natural History Museum of Utah's annual Behind the Scenes event. 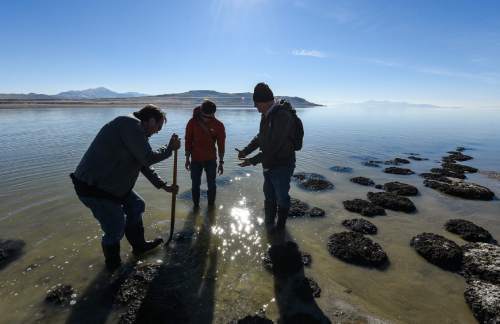 The public is invited into the museum's labs and collections rooms from 10 a.m. to 5 p.m. Francisco Kjolseth | The Salt Lake Tribune Researchers gather at The Great Salt Lake to gather small rock like structures formed by cyanobacteria known as microbialites. Will Black, left, and Tim Lee, center, an exhibit designer with the Natural History Museum are joined by Thomas geologist Thomas Chidsey as they carefully pull a structure for a living exhibit.These domed structures cover about 386 square miles, nearly 23 percent of the lake's bed, and offer a glimpse of what the Earth was like for its first 3 billion years. 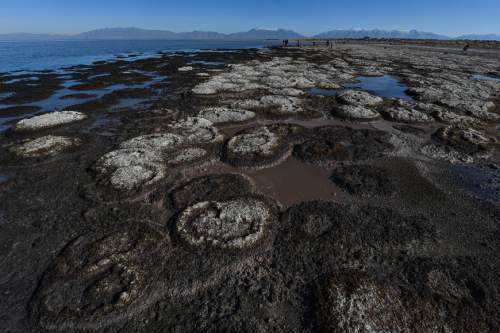 Francisco Kjolseth | The Salt Lake Tribune Researchers gather at The Great Salt Lake to study small rock like structures formed by cyanobacteria known as microbialites. These domed structures cover about 386 square miles, nearly 23 percent of the lake's bed, and offer a glimpse of what the Earth was like for its first 3 billion years. 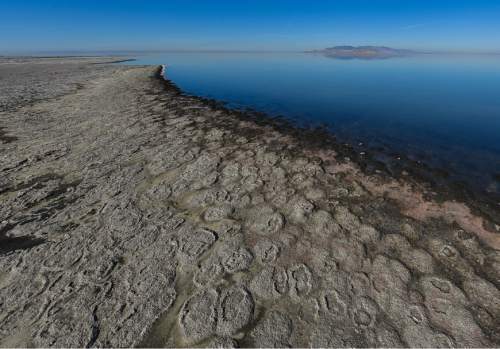 Francisco Kjolseth | The Salt Lake Tribune Researchers pull small rock like structures formed by bacteria from the Great Salt Lake. Known as microbialites, the specimens will be on display Saturday at the Natural History Museum of Utah's annual Behind the Scenes event. 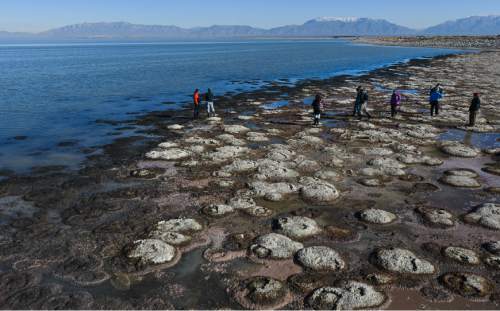 The public is invited into the museum's labs and collections rooms from 10 a.m. to 5 p.m. Francisco Kjolseth | The Salt Lake Tribune Researchers gather at The Great Salt Lake to study small rock like structures formed by cyanobacteria known as microbialites. These domed structures cover about 386 square miles, nearly 23 percent of the lake's bed, and offer a glimpse of what the Earth was like for its first 3 billion years. 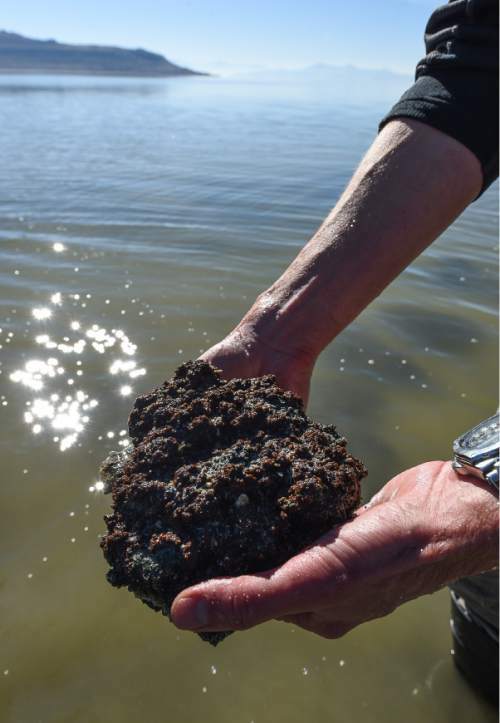 Francisco Kjolseth | The Salt Lake Tribune Researchers gather at The Great Salt Lake to study small rock like structures formed by cyanobacteria known as microbialites. Once exposed to the sun the structures dry and collapse as seen along the shoreline. These structures cover about 386 square miles, nearly 23 percent of the lake's bed, and offer a glimpse of what the Earth was like for its first 3 billion years. 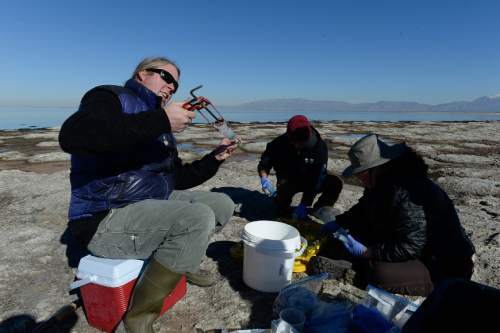 Francisco Kjolseth | The Salt Lake Tribune Researchers gather at The Great Salt Lake to study small rock like structures formed by cyanobacteria known as microbialites. These domed structures cover about 386 square miles, nearly 23 percent of the lake's bed, and offer a glimpse of what the Earth was like for its first 3 billion years. 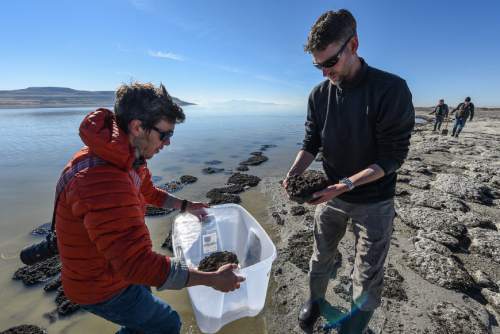 Francisco Kjolseth | The Salt Lake Tribune Researchers gather at The Great Salt Lake to study small rock like structures formed by cyanobacteria known as microbialites. These domed structures cover about 386 square miles, nearly 23 percent of the lake's bed, and offer a glimpse of what the Earth was like for its first 3 billion years. 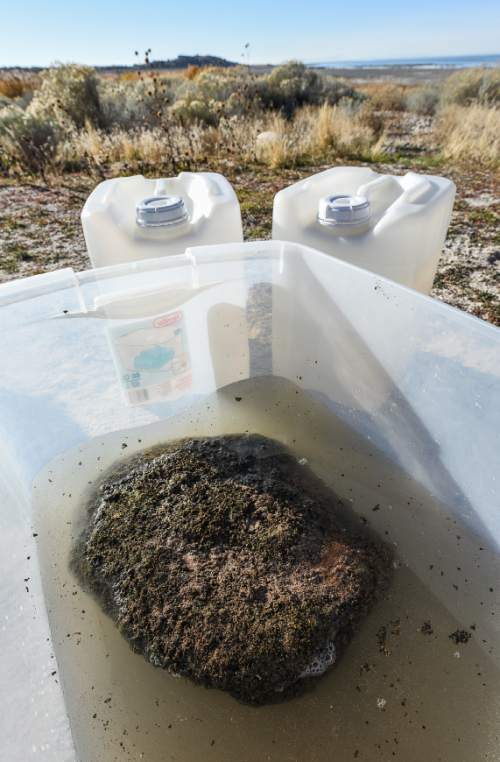 Francisco Kjolseth | The Salt Lake Tribune Eric Boyd, a Professor of Microbiology at MSU in Boseman Montana gathers water samples from the Great Salt Lake. Researchers were pulling small rock like structures formed by cyanobacteria known as microbialites. These domed structures cover about 386 square miles, nearly 23 percent of the lake's bed, and offer a glimpse of what the Earth was like for its first 3 billion years. 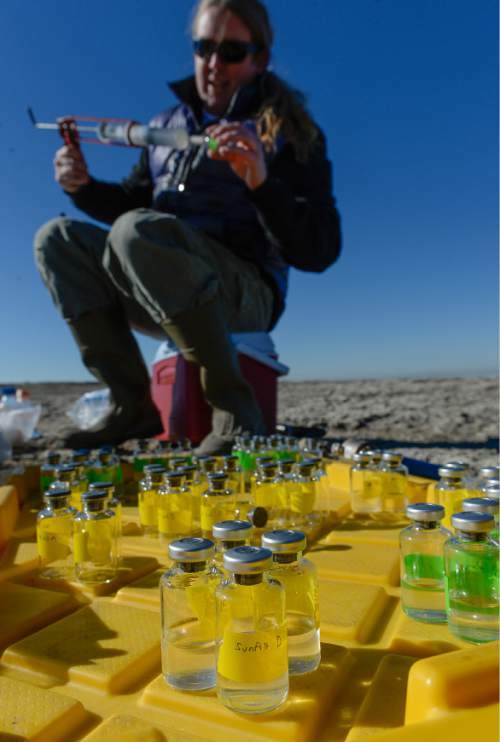 Francisco Kjolseth | The Salt Lake Tribune Eric Boyd, a Professor of Microbiology at MSU in Boseman Montana gathers water samples from the Great Salt Lake. Researchers were pulling small rock like structures formed by cyanobacteria known as microbialites. These domed structures cover about 386 square miles, nearly 23 percent of the lake's bed, and offer a glimpse of what the Earth was like for its first 3 billion years. 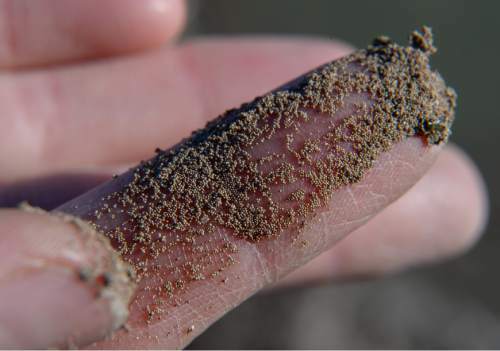 Francisco Kjolseth | The Salt Lake Tribune Bonnie Baxter, a biologist with Utah's Westminster College, shows off the tiny brine shrimp eggs that cover the shoreline of the Great Salt Lake. Antelope Island State Park • As Utah&apos;s Great Salt Lake continues to drop during recent years of drought, something strange and wonderful is coming into focus in the shallows and exposed lake bed. 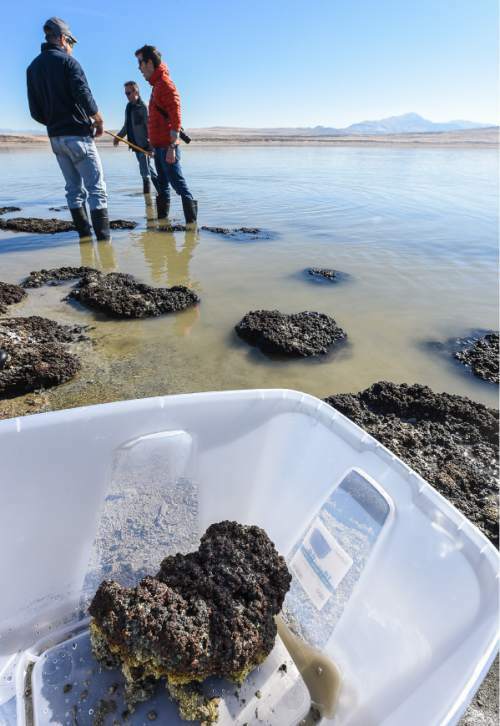 "It&apos;s rocks that are alive," biologist Bonnie Baxter of Westminster College said, surveying an expanse of domed calcium-carbonate structures where the water meets Antelope Island&apos;s receding northwest shore. A black gelatinous muck coats these rocks, containing a diverse community of tiny organisms. No one knows for sure which form the structures and which merely reside in them. Baxter and other scientists are looking to unravel the mysteries of the microbialites, arguing they form the lake&apos;s ecological foundation. Lurking below the lake&apos;s surface "resides the largest known extent of living microbial bioherms in the world, providing an analogue for a rare glimpse into the development of early Earth," wrote Robert Baskin in his recent doctoral dissertation. Cyanobacteria associated with microbialites are among the Earth&apos;s oldest life-forms, credited with creating the oxygen that fills the atmosphere and making higher life-forms possible. About 30 percent are found in the lake&apos;s North Arm, where the water is saturated with salt, thanks to a railroad causeway that has cut off Gunnison Bay from the South Arm and its inflows of fresh water. The microbialites here no longer support living communities, proof that human influences can wipe out these bacteria. "Because the lake is split, we have a natural laboratory for studying these things. We are defining the chemical limits on their survivability. Why are they there is the big question, and what is their role in the ecosystem?" said Baskin, a hydrologist with the U.S. Geological Survey. Loss of these organisms could disrupt the lake&apos;s delicate rhythms of life. "They might be the most important set of microbes in the lake to do photosynthesis. These might have a huge contribution to the primary productivity of the lake. 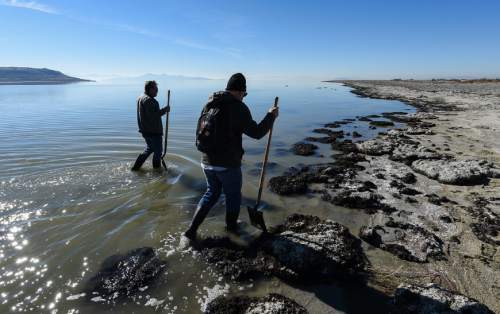 That&apos;s the first level of any ecosystem, and it&apos;s not defined in the Great Salt Lake," said Baxter, who studies the lake&apos;s microbes and serves as director of her college&apos;s Great Salt Lake Institute. 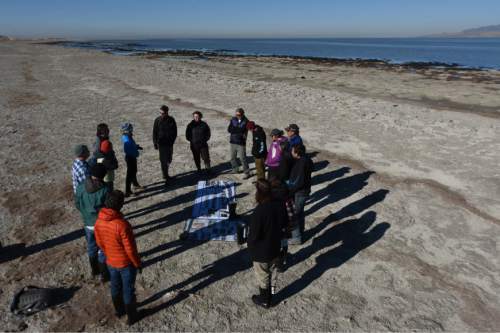 This month, Baxter hosted a gathering of scientists near Antelope Island&apos;s dry marina, a spot that hosts the most accessible bioherms. Her guests included researchers from NASA&apos;s Jet Propulsion Laboratory and Montana State University. The daylong meeting&apos;s goal was to generate research ideas for advancing knowledge and public awareness of this largely invisible resource. Staffers from the Natural History Museum of Utah were on hand to retrieve specimens for a forthcoming exhibit. The museum&apos;s chief exhibit designer, Tim Lee, searched for bioherms of about 20 inches in diameter to fit in a special 27-inch tank the museum had built. "We have to match the high salinity and temperature of the lake in an acrylic tank," Lee said. "The challenge is to keep it clean and the microbialites alive. We are trying to figure out how to make available all the exciting research happening behind the scenes by our staff." Scientists agree there&apos;s a compelling story to tell. "It&apos;s where geology and biology come together," Baxter said. "Everyone knows about [the lake&apos;s] brine shrimp, but these things are more important in the ecological picture." The oil and gas industry is becoming interested, and exploration firms are funding much of the current research, including Baskin&apos;s. There is a strong correlation between hydrocarbon deposits and ancient microbialite beds, according to geologist Mike Vanden Berg of the Utah Geological Survey. "Oil companies come out here," he said, "to examine a modern analog to ancient oil-bearing rock." Yet so much remains unknown and scientists can hardly agree on what these bioherms should be called. Microbialite is a catchall term, but some of the lake&apos;s examples qualify as stromatolites  laminated structures  and some as thrombolites, which are clotted, according to Baskin. The lake&apos;s bioherms are up to 2 meters in diameter and can rise more than 1.5 meters above the lake bed. "They change the electrochemistry in the area and cause the chemicals to precipitate and make this rock," Baxter said. "We don&apos;t know which model is the case here." "It is a difficult question," Baxter said. "Are they different than the microbes that we find in the water? When we find ones that are the same, we know they are tenants. When we find ones that live only in the microbial ties, we think we may have the architects." Brian Maffly covers public lands for The Salt Lake Tribune. He can be reached at bmaffly@sltrib.com or 801-257-8713.